I was watching some butterflies recently when my eye was caught by something tiny (we’re talking a quarter-inch long here) bouncing across the dirt in front of me. I peered down and snapped a couple of photos before it disappeared. I’d seen enough to recognize it as a spider and the photos, while not great, were good enough to enable me to identify it as a striped lynx spider, a kind of jumping spider. Not long after that, I was again watching butterflies and other bugs inhabiting a mock orange hedge, when I saw this little creature. Again, no more than a quarter inch long, it’s movement caught my eye against the glossy green of the mock orange leaves. A different kind of jumping spider, it hung around, enabling me to get this photo, because it had latched on to what I think is a parasitic wasp. Jumping spider don’t make webs, they pounce on their prey. 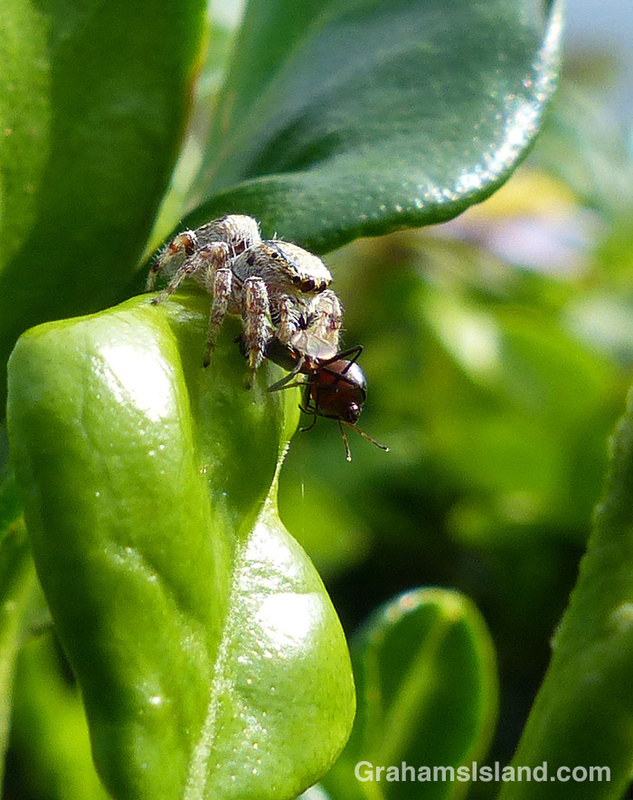 Jumping spiders are in the family Salticidae, but there are numerous species within the family and I haven’t yet been able to identify which this is. A characteristic of these jumping spiders is the pair of large eyes in front. This gives them very good eyesight, useful in identifying prey. Another thing I’ve found out is that they’re everywhere around here. Now that I’m aware of them, and looking out for them, I see them often where I had never noticed them before. Mine eyes have been opened to the glories of the jumping spider – or something like that.